Yesterday, the Federal Reserve lowered its target for the federal funds rate to a range of 0.25 percent to zero. Many experts had been expecting a half point cut, to 0.5 percent. The federal funds rate is the interest that banks charge each other when they loan typically short term money to one another. If it is cheaper for banks to borrow money from one another and from the fed, then they will loan more money out. 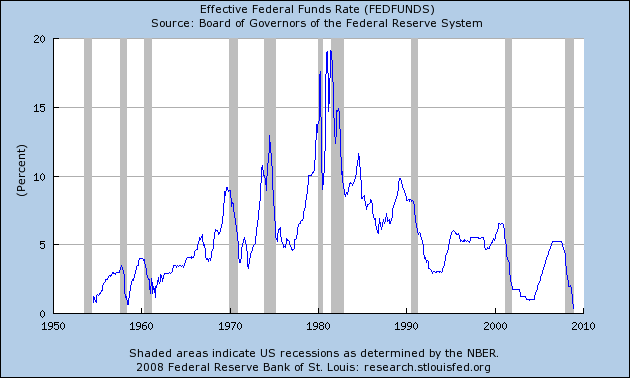 In theory, lowering the federal funds rate will thereby stimulate the economy with an influx of capital spread around. So, what does this mean to the average consumer? Not much really. Now the prime rate is at three percent. Changes in the fed funds rate have far-reaching effects by influencing the borrowing cost of banks lending. The changes in the rates affect the returns offered by banks on certificates of deposit, savings accounts, and money market accounts. Changes in the fed funds rate and the discount rate also dictate changes in the Prime Rate. The prime rate is the underlying index for most credit cards, home equity lines of credit, auto loans, and other personal loans but not home mortgages which are tied to treasury bills. Many small business loans are also indexed to the prime rate. Yesterday’s interest rate cut was the 10th cut in just over a year. How much further can the Federal Reserve go? They have already pretty much reached the bottom. The federal funds rate is finite and can only go to zero. The Federal Reserve has almost run out of their options to stimulate the economy. They have played all of their cards. The only thing that they have left is to invent new cards. The Federal Reserve is now looking at options that did not previously even exist. The fed is talking about creating new debt instruments (issuing its own bonds) if this rate cut does not help bolster the economy. “[T]he Fed has moved into uncharted unorthodox monetary policy as a severe stag-deflation is taking place,” said Nouriel Roubini, professor of economics and international business, at New York University. So, what should you do? Is the sky falling? No….there is nothing new that we can do. We all just have to watch our ever shrinking money market returns and wait for the country to exit the recession we are currently in. And, we will exit eventually. Maybe will have seen the bottom of this bear market and maybe we haven’t. But, eventually the stock market will recover. The best thing we all can do is continue automatically investing every month using dollar cost averaging and a sound asset allocation plan.